This work is happening ahead of the L-train closure that officially starts now on April 27. As the MTA and DOT announced last week, this SBS service launches on Sunday, April 21 "to allow for customers to sample and become acclimated to new travel options." 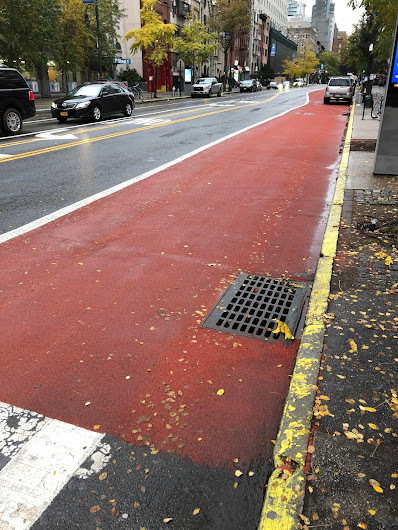 "With DOT crews now putting down new street markings for bus lanes and bike lanes, we are deeply committed to having our streets ready for the tunnel closure next April," DOT Commissioner Polly Trottenberg said in a statement issued last week. "From a ‘bus bridge’ over the Williamsburg Bridge to the 14th Street Busway, from more Citi Bikes to expanded pedestrian space for displaced train commuters, we and our MTA partners are up for this enormous challenge." The SBS route was originally set to start on Jan. 6. Officials haven't offered a reason why the start date was pushed back to April 21. The M14 SBS will supplement existing M14A and M14D local bus service on 14th Street, making five stops in each direction between First and Tenth Avenues ... Just before the L train tunnel reconstruction project begins, the M14 SBS route will be extended east to the planned Stuyvesant Cove ferry terminal on the East River to accommodate ferry customers from Brooklyn. 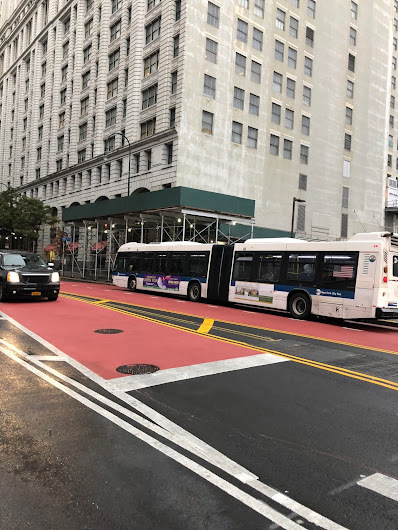 Once M14 SBS is implemented, combined with the existing 14th Street local bus service and daily high-occupancy vehicle restrictions on most of 14th Street from 5 a.m. to 10 p.m., crosstown buses will be scheduled no more than two minutes apart during peak hours. The L tunnel reconstruction website has more background and FAQs. 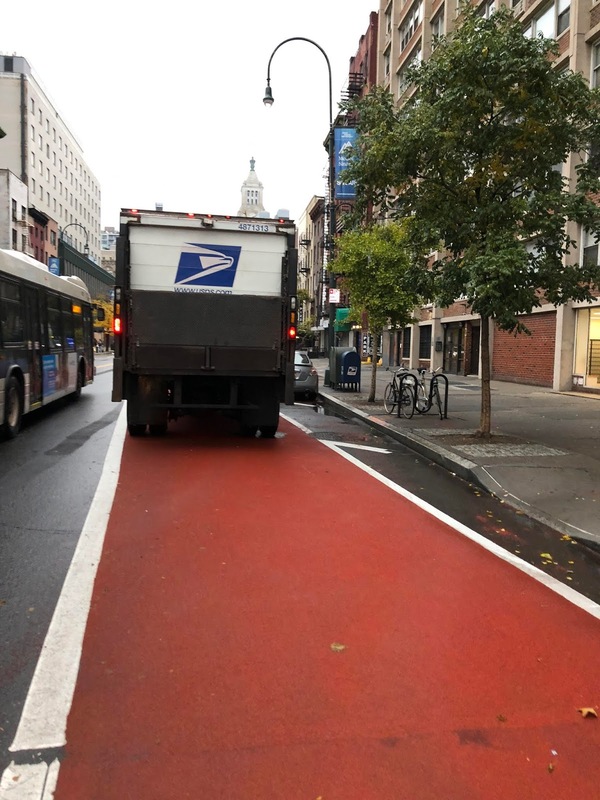 Has anybody tried riding on the new bike lanes on 12th and 13th? Car service and delivery vehicles are already clogging the lanes. I hope there's is ticketing to match the parking frenzy. It took me over 45 minutes on the Eastbound Crosstown 14th St bus to get from 7th Ave. to 3rd Ave. on last Thursday. This is going to be the norm soon as illegal parking, left turns and a "dedicated bus lane" increase the traffic chaos on 14th St. It already looks foreboding of commuter chaos. street markings - and wondered just what was happening to this neighborhood. and not get ticketed ? I have very low hopes for this. Just look at the complete lack of enforcement for HOV on the Queensboro Bridge. The 2nd Ave SBS is a joke, frequent headways of 20 minutes or more. And as the commenter above notes, getting across on the existing services is glacial. In fact, bus service in general in Manhattan has degraded rapidly in the past six months. I waited 48 minutes for an M21 on Houston St a couple of Friday nights ago. Waiting for an M5 on Riverside Drive at 5:30pm the other afternoon, I pulled up BusTime on my phone only to find that there were no southbound buses between 72nd Street and 145th. Ridiculous. Just what is Andy Byford doing, besides making grand claims and pleas for New Yorkers to be patient? The 14th St road markings are totally wackadoodle. why couldn't a straight line be done like on 23rd St? buses are a wreck, I'm on an M8, in the rain & the water is pouring in through the lights. fun. I agree with 8:51 am, if the enforcement doesn't match the design, chaos will reign. Oh wait, it already does. 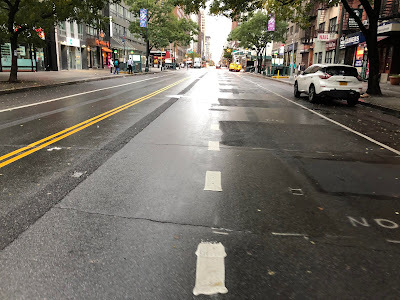 I hereby propose that 14th Street’s name be changed to Wackadoodle Way, in honor of the crazy looking lane markings where none of the lines seem to correctly line up. If you needed any more proof that there is no actual working plan for the L train shutdown, this is it. I see all kinds of crazy markings on 14th Street, and I have NO idea what the hell they're supposed to mean. And, I bet, neither do DRIVERS - thus putting EVERYONE at great risk when we cross the street. Thanks for nothing, MTA and DeBlasio. The M14 SBS is a total joke. Providing the M14A and D as local services is a slap in the face to the residence's of the Lower East Side/East Village. Both the A and D could easily benefit from being SBS routes. Just replicate what was done on 34th Street and call it a day. Chiming in to agree that I have been wondering what the hell some of the new markings mean. Eastbound between Second and First Avenues (I think), there is now a lane which appears to be for moving vehicles but leads directly into a parking lane. Someone's going to drive right into the back of a parked car, just by following the lines (which are all solid, by the way, implying to me that one is not supposed to change lanes). The most retarded thing I've ever seen. Multiple lanes of red side by side approaching Union Square. It's baffling.